Bikes vs Cars was not as confrontational as I expected. It was somehow sad, frustrating, informative and uplifting all at once. It relays the personal experiences of Dan Koeppe living in LA and Aline Cavalcante living in Sao Paulo. Through their experiences and opinions about cars and cycling, the movie unveils the challenges of cycling around in large car-centric cities. It reveals a number of interesting statistics about traffic jams, links between car companies and politics and the impacts of car driving on inhabitants of cities. There are some impressive images of intense traffic jams and extensive motorway systems from around the world that make Auckland’s Spaghetti Junction look minor. Images of Aline making her way in-between lanes of traffic filled with fast moving and often swerving cars, buses and trucks are heart stopping. We learn that a close friend of Aline lost her life in the traffic of Paulista Avenue, one of the busiest streets in Sao Paulo. We accompany her on a vigil and protest ride in the rain to put up a ghost bike (bike painted white and installed on the side of the road) and spray paint a white cyclist on the road. For a little shock value, we also learn that another cyclist got his arm torn off by a car also along Paulista Avenue. The car driver did not stop but drove on for 5 miles to drop off a friend and then dropped the arm in a creek. These stories and the related statistics about deaths from cycling are sobering. Dan talks about how as a cyclist, LA is not the best city to live in: 70% of the land in LA either in use as roads or car parking. We accompany Dan as he tries to track down remnants of the historic California Cycleway which was intended to link Pasadena to LA. Only ever partially completed, the trails demise could be pinned to LA’s love affair with the car. We learn about ‘Carmegeddon’, anticipated traffic chaos when it is announced that 10 miles of Interstate 405 in LA will be closed for road works over a weekend in 2011. There is so much hype in the media that people stayed off the roads that weekend. We follow a cyclist as he enjoys a rare ride around quiet smog free streets, ironically with moving oil rigs in the background. Returning to images of severe traffic jams in Sao Paulo, we hear Professor Raquel Rolnik argue that traffic jams are part of the solution because it gives a good reason to invest in alternative modes. In New Zealand’s case its true. This government invests in cycling and other alternative modes because of the congestion relief benefits. The film leaves you with a clear sense that change is needed. Statements like: biking is like swimming with the sharks, or, ‘I wish I had the nerve to ride a bike’ make viewers realise they don’t want people biking in their cities to have this experience. Aline discusses the sense of entitlement that car drivers have to the road. She pulls out one of the best lines of the film ‘you own the car not the street’. Thankfully, and after some effort on the part of Aline and her friends who talk to council about the situation, Paulista Avenue gets a new cycleway. 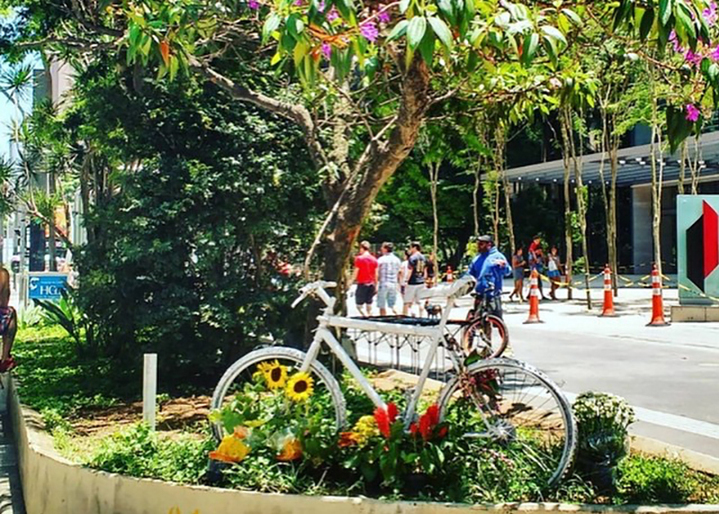 It is opened in 2015 amid media claims that Sao Paulo is becoming bike friendly. Let’s hope it is the beginning of the end of ghost bikes. It’ll only take 5 minutes but every voice counts! 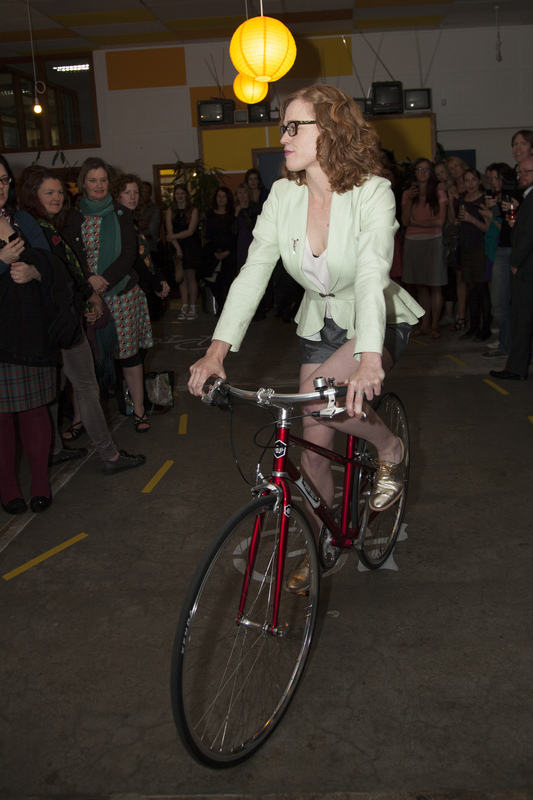 I am writing on behalf of Frocks on Bikes. 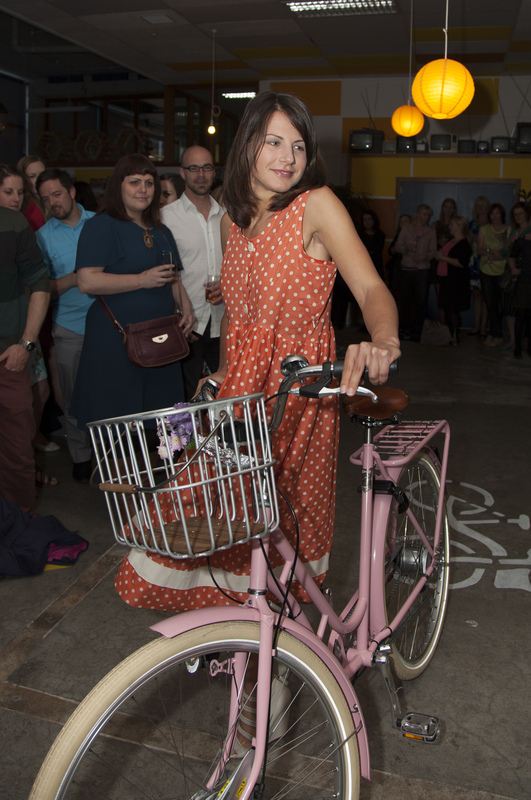 We aim to get more women on bikes in everyday life. We would like to show our support for the proposed design of the Hut Road Cycleway. We support the proposal to remove hazards from the cycleway, remove parking and to separate people walking from people on bikes, as reflected in our response in the electronic form. The addition of speed-bumps to entrances and exits of parking lots is also a good idea. We have a few questions about cycling culture and attitudes towards cyclists. We anticipate that once this cycleway is built there will be more cyclists and the potential for a broader range of cycling types on the route. The path is currently used by high numbers of long-distance commuters and sports cyclists, but I’m sure that there would be residents in Ngaio and Khandallah who could be converted to cycling, as well as Wellingtonians who would use the route to access shops along Hutt Road. How will you encourage residents of Wellington to use the cycleway, especially once it connects safely to the city? How will you ensure that the community will respond positively to the additional cyclists? Also, how will you ensure drivers are aware of cyclists on the route – both at driveway entrances/exits and at the complex intersection at Ngauranga gorge and noting that cyclists (still) travel both ways on the cycleway? 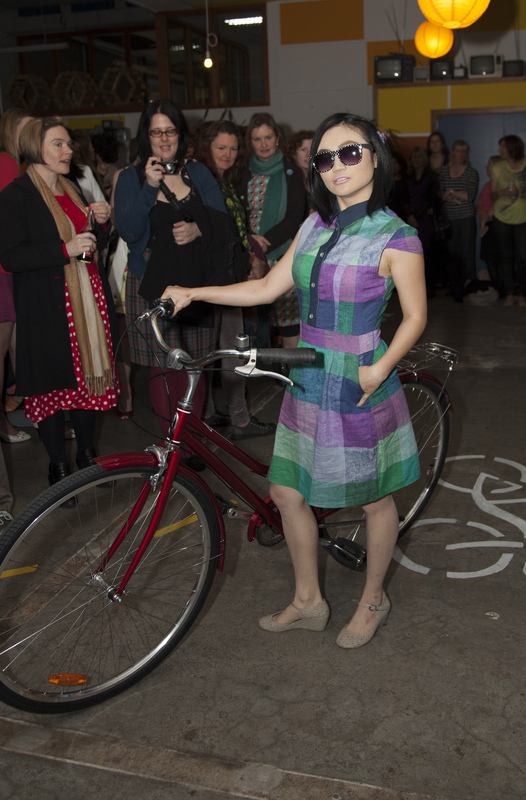 Frocks on Bikes is happy to help. We can promote the route, could organise a ride to the opening day for the route and arrange a ride soon after opening to promote its everyday use. The ‘Pink Path’ has created such a positive and exciting vibe for cycling in Auckland. It has also been really well used. It would be wonderful to create a similar buzz in Wellington. We are not suggesting that the Hutt Road Cycleway is such a flagship route, nor that it should be painted pink but we would encourage the council to consider a route or routes that might be. 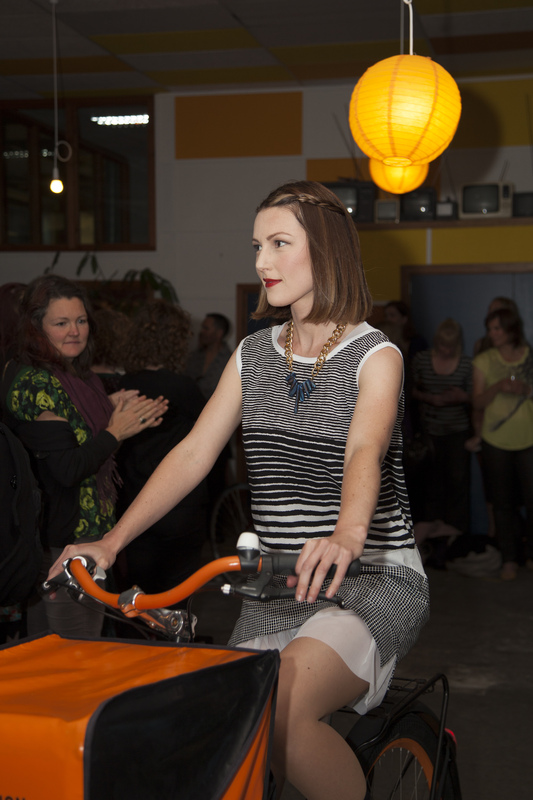 We are excited about the prospect of safer cycling infrastructure in Wellington. Thank you for considering our ideas. Nic Williams reporting on the success of the Frocks on Bikes Acukland ride with Janette Sadik-Khan. 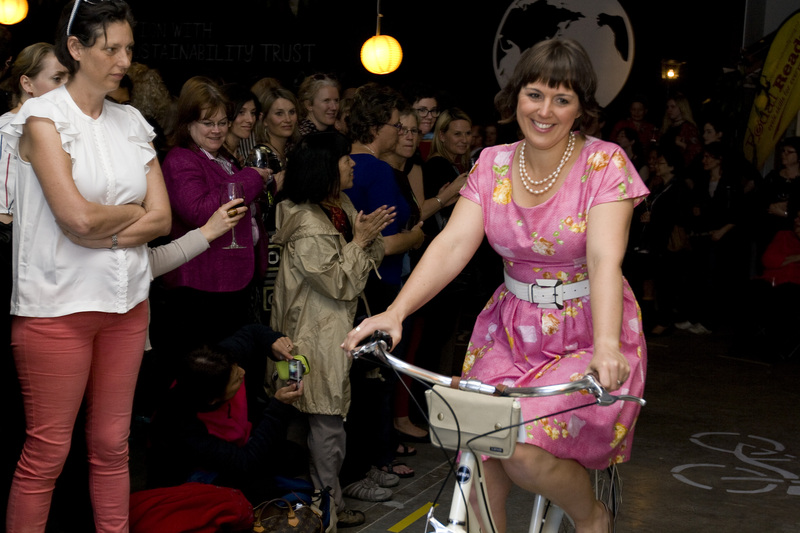 Frocks on Bikes Auckland were thrilled when Janette Sadik-Khan agreed to come on a bicycle ride with us as part of her hectic four day schedule in Auckland. 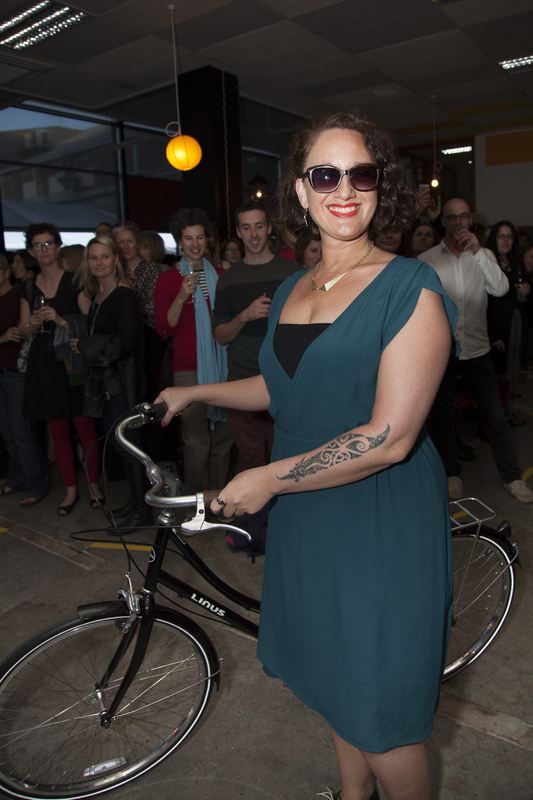 Given the relatively low proportion of women on bikes generally in New Zealand, we wanted to introduce her to the amazing women working to make this city a great place to cycle, as well as hear her thoughts on how to improve our streets for all the people who use them. thought an e-bike might help her enjoy Franklin Road a little more after recently arriving from NYC. We were joined on the ride by Seth Solomonow, Janette’s colleague from the NYC Department of Transportation (where Janette was Commissioner until 2013) and a group of gentlemen frockers who politely kept their distance from the excited women riders. Our route began from Queens Wharf where we were immediately met with the test of negotiating the western end of Quay Street to access the Viaduct. Given the difficulty of moving from far left to far right lanes to access the Viaduct, we opted for a safety first approach that meant carefully and respectfully sharing the space with the ‘promenaders’ along the wider northern footpath of Quay Street. 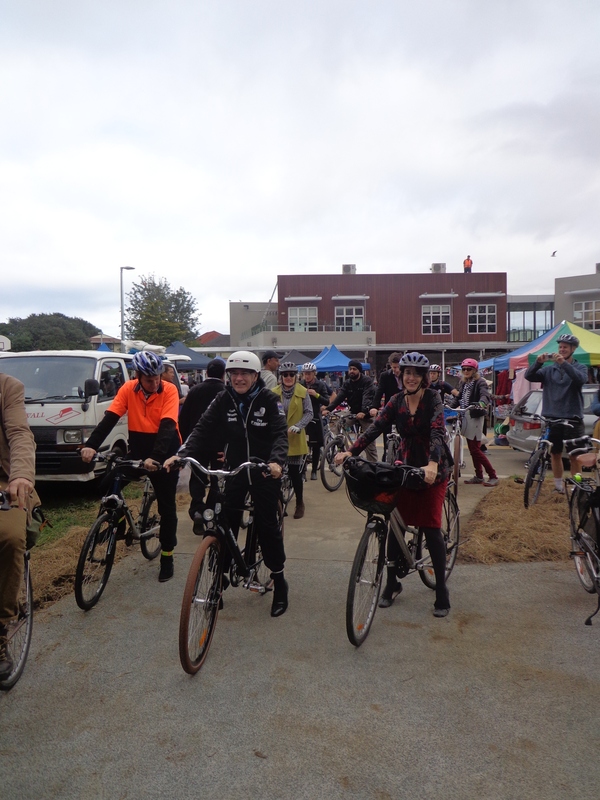 Despite the Wellington style wind, we felt really proud on parts of the ride showing off Auckland – particularly through Wynyard Quarter and the newly opened section of Daldy Street. Whilst parts of the ride showed just how far we still have to go, Janette is very excited by the potential of what she has seen so far and really thinks we are at a tipping point for transformational change. Fortunately for us we got Janette and Seth back to their hotel after a really enjoyable bike ride, with the majority of people along the way waving and smiling at a group of women having so much fun on their bikes. 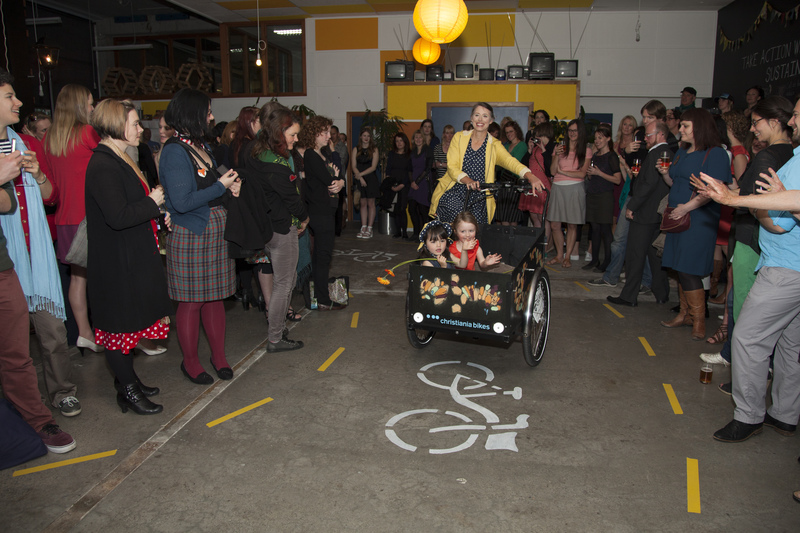 The more women out and about on two wheels, the safer your city. 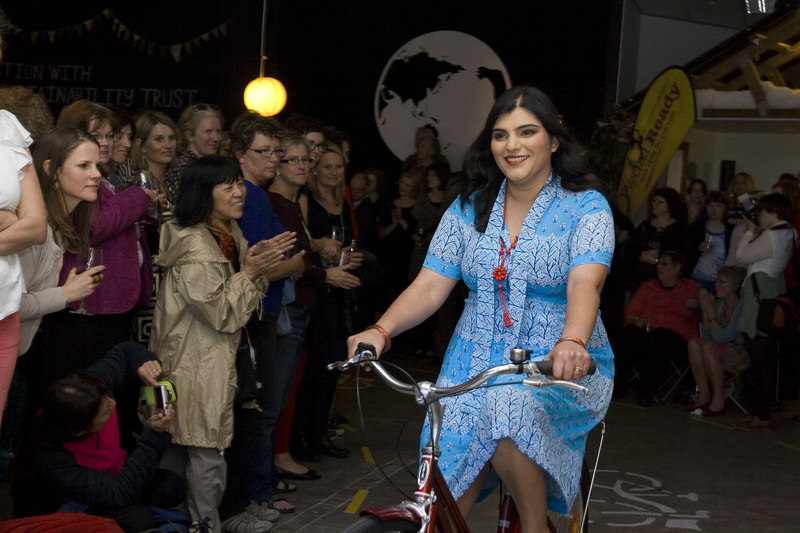 Women on bicycles are an “indicator species” for a healthy urban environment. The sight of women on bikes sends a message that cycling is fun and that roads are for sharing, which encourages even more people. In other words, there has been never been a better time to ride. Many thanks to Janette and Seth for their enthusiasm and inspiration. We loved “frocking” with you. 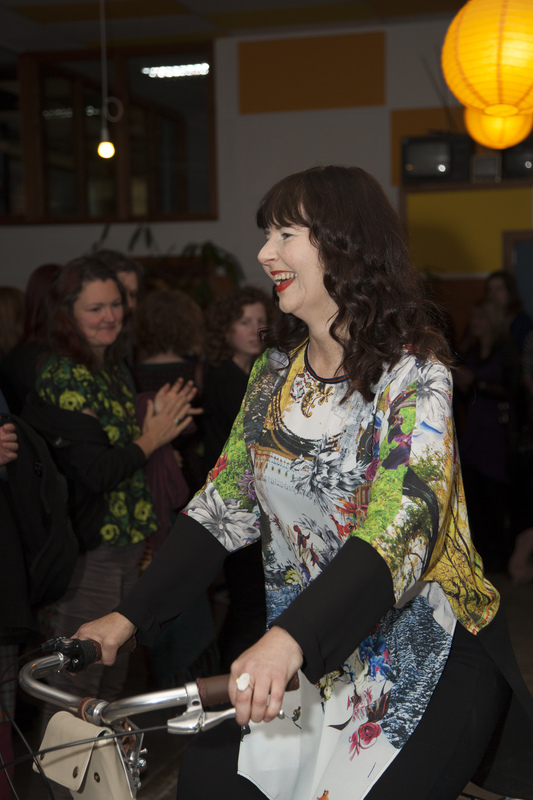 A special thanks also to Susan Quinn from Auckland Conversations for making the arrangements with Janette for the ride, and big ups to Cycle Action Auckland and The K’rd Business Association for chipping in to get these stunning photos taken of the ride by Richard Leonard. 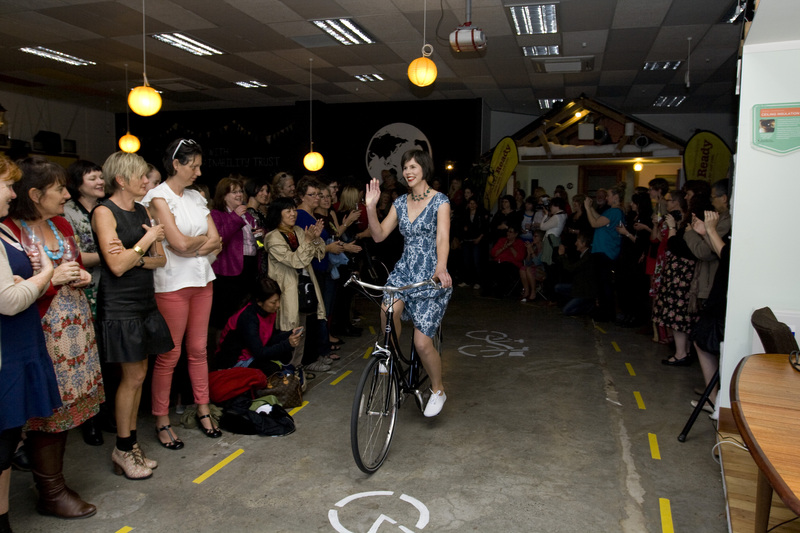 At the cycle friendly awards in 2010 Frocks on Bikes Auckland won not only the award for Best Cycling Promotion for Cycle Style 2010 but also an Avanti bike. Thanks to Avanti plus in Waitakere the bike was tricked up with the essential assessories including a basket, bell and mud guards. 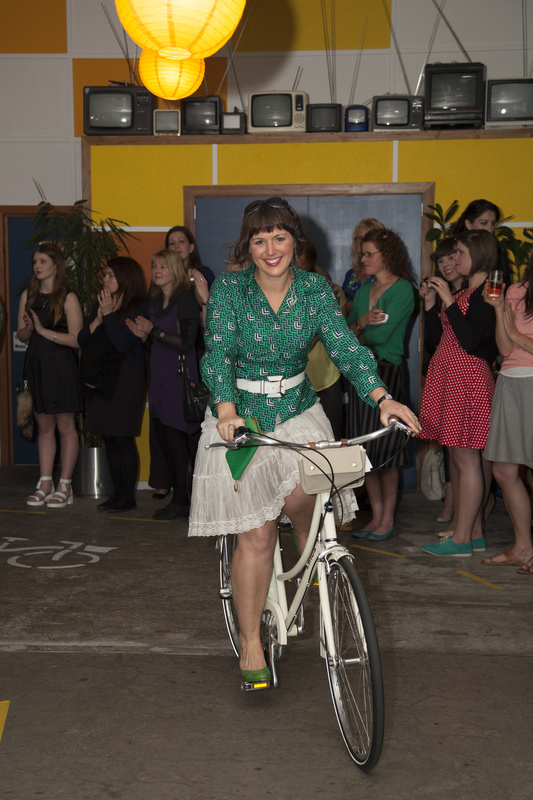 The Urban Bicycle Company donated beautiful Basil panniers to complete a perfect Frock bike. Julie Fairey, member of the Puketapapa Local Board, shares her experience of becoming a frocker. I’m quite sure she (or he) has had many names. I call her Bertie, for no good reason that I can fathom. 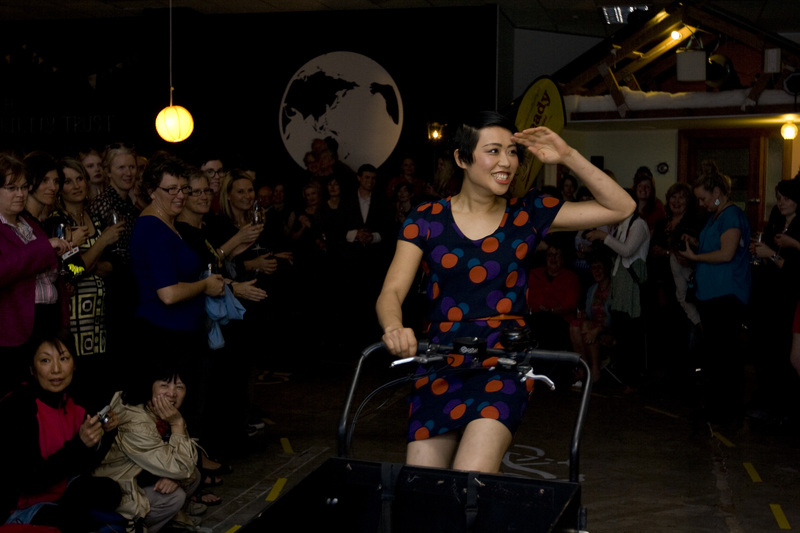 She is the Frocks on Bikes Auckland Bike, and for the last six months or so I’ve pretended that she is mine. Bertie didn’t get a name right up front. To start with she was an it, just a bicycle, to me a reasonably mystical machine that I was a little bit scared of. I fell off a lot, by which I mean I could tell I was about to fall off or that the bike was about to topple so I jumped. Some bruises, some scratches, but no real injuries except that one time I bashed my ankle up a bit. It was really after that, when I couldn’t cycle for a couple of weeks as the gash on my palm healed, that I realised I missed riding, I missed the bike and that bike was a she and she was Bertie. How this started was that I was inspired, mostly by Richard Barter (Chair of the Puketapapa Local Board) and Pippa Coom. It just looked like an easier way of life, an easier way to be; to cycle from A to B. But I needed a bike, one that I could use to get around my local area, carry a fair bit of stuff, and not be too heavy because I’d likely need to push a fair bit up the hills. 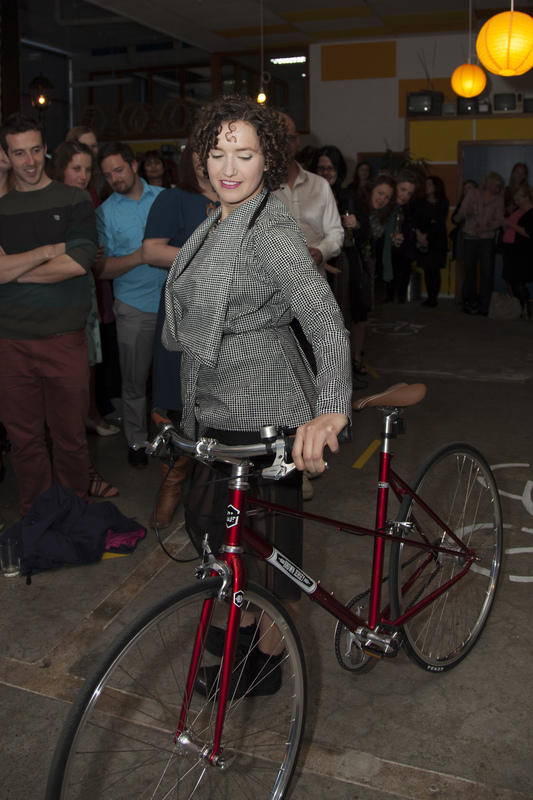 Pippa offered me a lender bike to try it out and now I am hooked. I knew how to ride a bicycle but had never been a regular cyclist, even as a child. I have had brief flirtations with bicycles for a day or two in Hoi An and Munich. It all looked fine on the flat, but I live almost at the top of a hill, in a quite hilly suburb (Mt Roskill) and my fitness and strength are poor. Having Bertie to borrow gave me a chance to see if I could make it work, make it part of my life. It took a while once I picked up the bike (in the boot of the stationwagon of course) to actually get on it, because first I had to brave rescuing my helmet from the part of the garage nearest the big spider webs and then wash any cobwebbyness off it. After about two weeks I screwed up my courage and did it. This was the first thing that was easier than I expected. Then I sorted out a little route to cycle near my house, and that was the second thing that was easier than I expected. I was quite exhilarated that what had seemed to me a very awful hill by car, bus and walking, was not so bad after all. I nearly made it to the top! Now I see that as quite a gentle slope really, but before Bertie it seemed intimidating and impossible. Every day for about two weeks I went for a ride, slowly increasing how many kms I was doing, and how many hilly bits, until I could do 10 kms. By then I’d worked out I wasn’t really interested in just going for a bike ride. I needed to be transporting myself and my stuff to something I needed to go to. So I decided that I needed a cupcake and cycled to Bluebells Cakery. But after that I really needed to come up with actual places I really needed to go to. I was fortunate that it was such a good, and long, summer. I am also fortunate that I live in an area with a cycleway running through it, which I use as a sort of spine to get places; ride from my place to the cycleway on the southern side of SH20, cycle east or west as needed, then north or south off it as needed. I love saying hello to people I pass although some seem quite bamboozled by it. I love parking Bertie at the places I need to visit in my suburb; the library, the Local Board office, the community centre, the park, the shops, and, of course, Bluebells Cakery. Since the weather got worse, and I’ve had some ill health, I haven’t been able to cycle so much and I miss it. Bertie is there, nice and warm and dry, waiting. I don’t feel guity anymore (I did for a while), now I feel hopeful that tomorrow might be suitable, or that next week I’ll be well enough, or that someone might give me the wet gear I need for my birthday. One day I’ll be able to buy a bike of my own and Bertie will go on to someone else. If that person is you, please be gentle with her. She taught me a lot, helped me to gain some independence from cars and roads and driving through my neighbourhood without touching it, rather than feeling, hearing, smelling and seeing it up close as I do on a bike. I hope Bertie, or another bicycle, will teach you all of that and more. And if you already know, perhaps you can spread the lesson by sharing a spare bike of your acquaintance with someone else who needs to learn it. 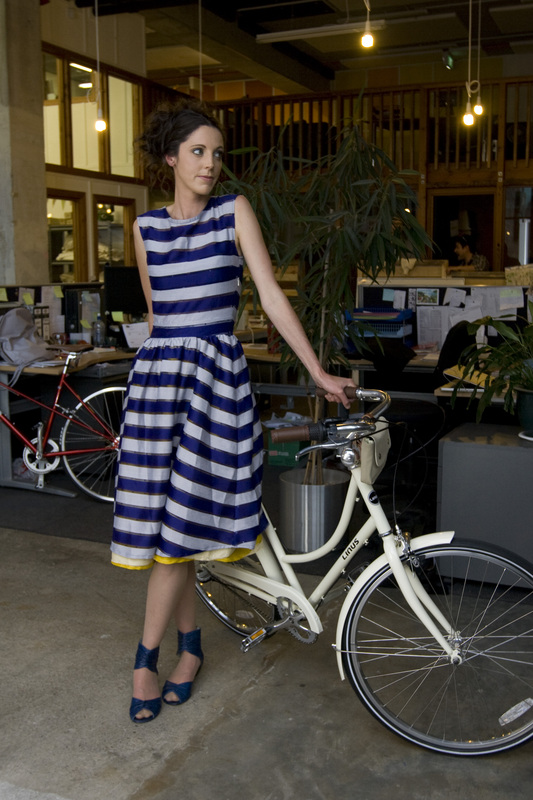 Christina was recently on Wellington’s Access Radio talking about Frocks on Bikes. Her interview starts about 24 minutes in.